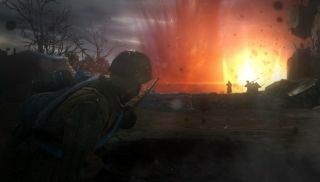 Earlier this week, we detailed the planned fixes and features of the free Company of Heroes 2 update, Turning Point. Now, Relic have announced Victory at Stalingrad, a DLC pack that will launch alongside the update, bringing new co-op and solo challenges, and three AI battles. Set in the Winter of 1942, it covers the Soviet counter-attack battles of Operations Uranus and Little Saturn. And yes, I've only highlighted those names in a crass attempt to encourage comment thread jokes. "Take command of the Red Army in a series of scenarios, challenges and battles based on this historic victory. Your strategic decisions will lead the Soviets from the jaws of defeat to a crushing victory." Oh no! Not the crashing jaws of victory defeat! 70 kilometers west of Stalingrad, Soviet forces must move rapidly to secure key locations and resources about the town of Kalach before mounting the final attack on the vital bridge across the River Don. The Red Army's 24th Tank Corps is headed deep into enemy territory to take the German airfield at Tatsinskaya and destroy the aircraft that keeps trapped German forces supplied in Stalingrad. Forced to wait for air units to be ready, the Red Army has had to delay Operation Uranus at the last minute. Irregular and Partisan forces have already moved to secure a key bridge across the Don River and must now hold out against determined German attacks. The Wehrmacht has launched Operation Winter Storm in an attempt to relieve their Sixth Army in Stalingrad. Soviet forces must block this attack to prevent the fascists from escaping the city. The Soviets defend the blown out Stalingrad inch by inch, all the while looking to the skies as the German Luftwaffe drops bombs on any target they can find. Months of bloody close-quarter fighting have led to a decisive turning point for control of Stalingrad. Most of the German 6th Army has been left cut off and surrounded in the city. The Red Army must repulse a breakout attempt by the exhausted German forces. Victory at Stalingrad will launch 12th of November, and be priced at $9.99.